In honor of the upcoming holiday of Chanukah, MazorBooks is proud to announce the newest addition to its growing library of Jewish Holidays books for kids. 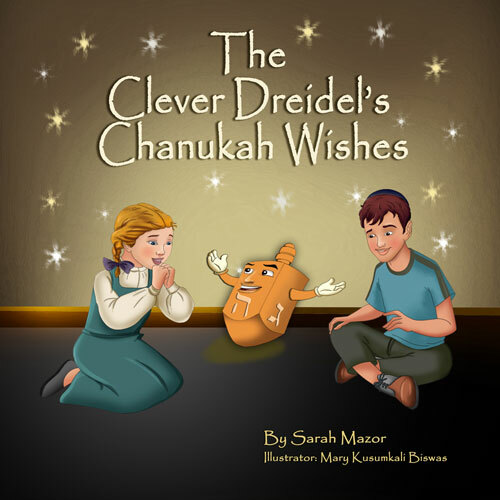 Coming soon to Amazon and Barnes and Noble – The Clever Dreidel’s Chanukah Wishes, a beautifully illustrated book that expresses heart felt sentiments shared by many. days is in celebration of the miracle that happened to the Jewish people in the Land of Israel over 2000 years ago, when the Maccabees prevailed over their enemies, the Greeks. The Clever Dreidel encourages kids to enjoy the holiday and its treats, but also asks kids to pray for new miracles as they light the candles each day and to wish for a world where all the children are happy and healthy and full of hope.